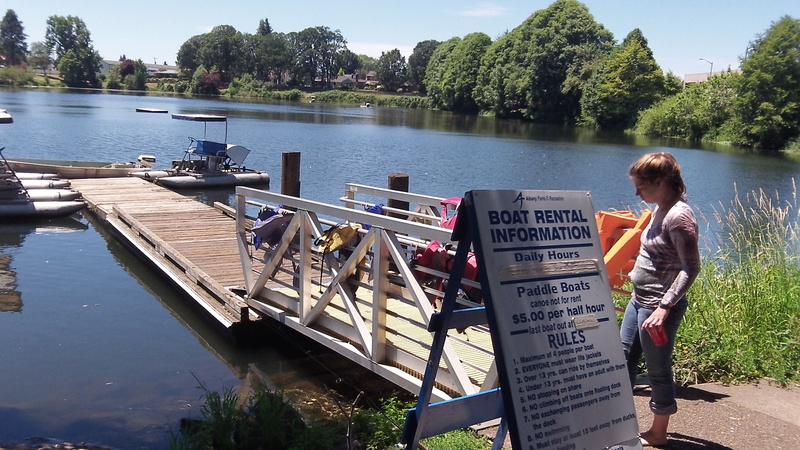 A sign board lists the rules for paddle-boating on Waverly Lake. Pedaling past Waverly Lake on Saturday, I was glad to see that in this time of turmoil and change, one Albany tradition is being kept alive this summer. The paddle boats are out there again, and have been since the last week of June. The paddle craft have been available for rent on the pond for the last several summers, sponsored by Coastal Farm and Ranch Supply. The attendant told me, when I asked him, that the company is the sponsor again this year, though the paddle boat item on the city website doesn’t mention it.